The delivered rods or rolls – depending on material and dimension – need to be cut to size. A precise, warp-free 90° cut without roughed edges is the basic requirement for the further processing to be optimal and reliable. 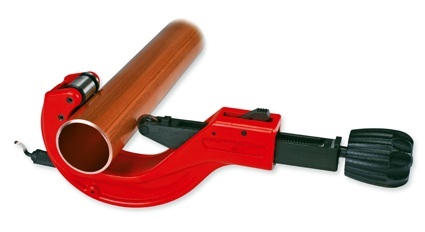 For this step in the work process a pipe cutter is available that can be used with various working material in many different dimensions. Small and medium dimensions can be cut using the cutting wheel technology, large dimensions with a chain wheel technology. Subsequently the metal piping (copper, stainless-steel) needs to be deburred, to assure that the seal is not pressed out during the insertion of the pipe into the fitting. Plastic pipes, especially multi-layer composite pipe and PEX pipes (except in very seldom cases) will need to be deburred and additionally chamfered and calibrated. For this step there are special tools available that can take care of this in one step and optimally prepare the pipe. It is also recommended that large dimensioned metal piping be chamfered. It makes the insertion of the pipe easier. The handworker is responsible that the installation meets all technical rules and standards. Drinking water lines are to be planned in a way that no area of stagnation is created. The conduit should be free from intersections and clearly arranged. The manufacturing of various connections on all levels or conducting a change of direction up to 180° without moulds or fittings belong to the set of basic professional skills that every craftsman should have. With this the installer influences the profitability of the drinking water treatment facility because there are no costs for moulds. At the same time, through the bending of the piping, drops in pressure within the system are minimized because of the reduced cross-sectional constriction. There are tools available in different designs for the bending of pipes, specifically made for the respective material. 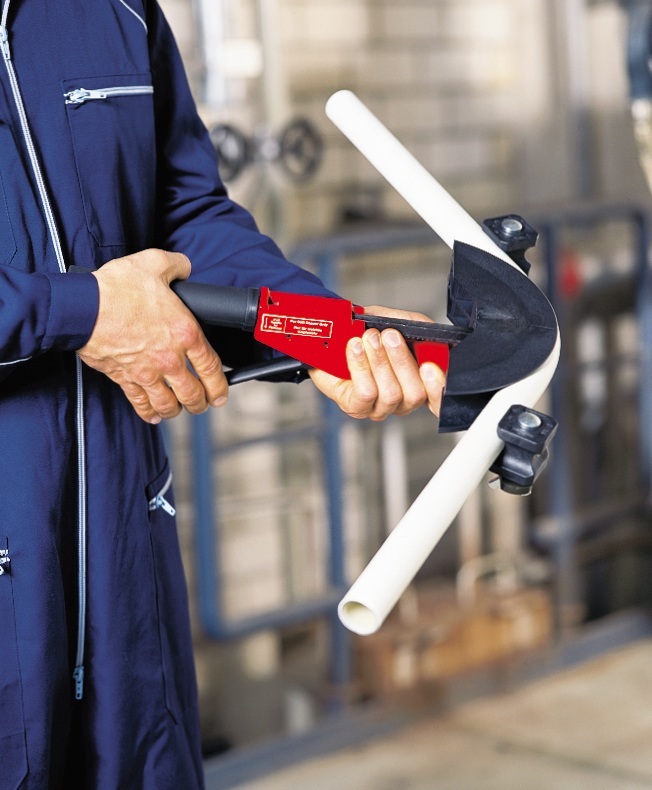 Depending on the construction situation – distribution in the basement, ascending pipes, and connection between floors – either a two-handed or one-handed bending tool is used or electrical bending tools are available for the construction of large industrial systems. Basically the possibility to bend piping is the most economical solution when installing piping systems. The final step of the piping system installation work is the leakage test. In most cases the leakage test is performed using water. Depending on the size of the system, leakage testing units with up to 60 bar pressure are available. In addition, the systems vary in the features (one or double-valve system) and the size of the tank. A special consideration is the testing pump, when during the leakage test of a piping system exact testing pressures – according the manufacture – need to be complied with. This is an especially important requirement by “non-pressed equals leaking press fittings”. 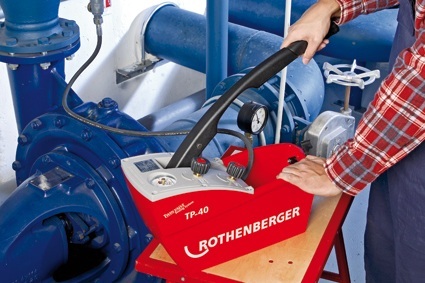 There are testing pumps available for this type of operation, that are equipped with a double-valve system, such as the precision testing pump TP 40-S from the German manufacturer ROTHENBERGER. Using the double-valve technology, areas prone to leak are reduced and the pressure constancy is increased. Through the second valve, the testing pressure can be easily and precisely regulated. The finely scaled manometer with drag pointer – which displays the maximum configured pressure – allows for precise measurements. The testing and pressure scale of the manometer is displayed in bar, psi and MPa. Author: Matthias Bambl. Product Management – Pressing Technology for ROTHENBERGER Werkzeuge GmbH, Deutschland, www.rothennberger.com. This entry was posted in Basic Knowledge, News. Bookmark the permalink.